NetSuite Services Resource Planning (SRP) is the industry's first and only on-demand business management software suite for the complete management of a professional services business. NetSuite SRP streamlines the services lifecycle from marketing to project management, service delivery to billing, revenue management to driving repeat business from existing clients. 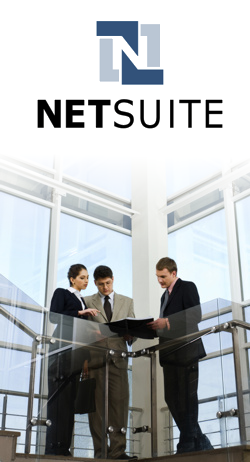 NetSuite SRP provides flexibility and ease of use for services organisations of every size. Growing services businesses benefit from an all-in-one solution from NetSuite, while mid-size companies and larger entities can choose enterprise-proven professional services automation (PSA) technology from OpenAir - a NetSuite company - which works seamlessly either with NetSuite or their existing back-office systems. Drive business performance across subsidiaries, geographies, projects, currencies and tax jurisdictions. Enjoy instant visibility into the health of your services business at corporate, divisional and project levels. Increase the profitability of your global services organization by improved resource utilisation. Reduce DSO by accelerating billing and invoicing while reducing administrative costs. Streamline global operations by optimising staffing resources and managing projects more efficiently. Drive project profitability by clearly accounting for project time and expense. Increase your services team's productivity across divisions and subsidiaries by providing anytime, anywhere access. Use global dashboards and reports to combine financial and operational project drivers (such as utilization and profitability) for projects, subsidiaries and geographies, at all levels up to and including corporate. Identify issues and make crucial mid-course corrections at the strategic and operational level. Improve services productivity and reduce errors across all divisions with a powerful time-and-expense entry system. Customize the approval management process by client and project and use electronic routing for line, multi-level or project-based approvals. Easily and efficiently manage and analyze project finances, from bid preparation and time-and-expense tracking through client billing systems and internal charge-backs. Recognise, manage and bill revenue for projects across multiple currencies and tax jurisdictions using NetSuite SRP's support for multiple currencies and international taxes.